This photograph, made in 1909, shows an open wooden chapel for the blessing of water in the village of Deviatiny, located on the Vytegra River some 20 kilometers north of the town of Vytegra. 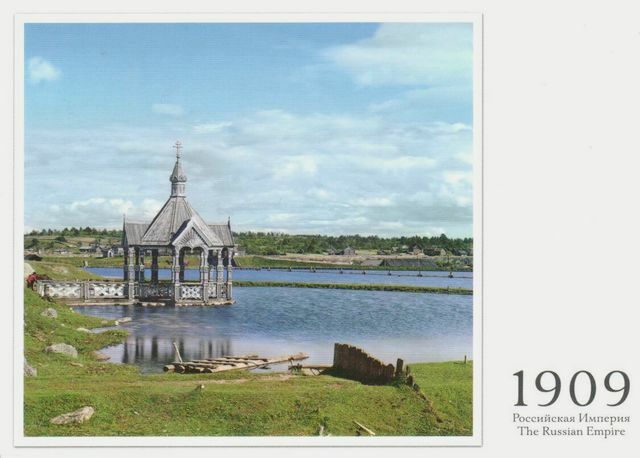 Built over a pool at the riverbank, the chapel has decorative carving in the manner of a pavilion. In the background is the river, with village houses on the far bank. The Vytegra River, which flows northwest into Lake Onega, is one of the components of the Mariinskii Canal system (now known as the Volga-Baltic Waterway) that links Saint Petersburg with the Volga River basin. Although only 64 kilometers in length, the Vytegra is the essential link between Lake Onega and the Kovzha River, which empties into White Lake to the southeast.